Sweat equity is a term used often when talking about the creation or building process. It’s about doing the work — the hard work — to bring an idea to life. A “partner mom” helps build her Habitat home. At Habitat for Humanity, sweat equity is a new homeowner investing in their home or one for another family. It’s not a form of payment, but an opportunity to work alongside volunteers who give their time to bring to life a family’s dream of owning a home. 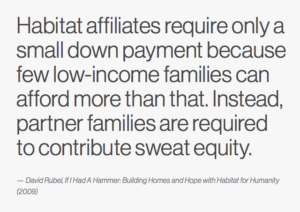 Sweat equity can take many forms for partner families working with Habitat. It can mean construction work on their home or on a home for another family, cleaning up the build site, working in a Habitat ReStore, assisting in administrative duties, or countless other ways of helping out. Homeowner classes — learning how to manage a home or finances — also count as sweat equity. Families invest their time in the long-term success of their homeownership. Throughout the process of purchasing their home, Habitat partner families can earn sweat equity credit as they learn about their mortgage, insurance, maintenance, safety and more. That co-worker approach informs Habitat’s emphasis on sweat equity: all of us working together so that homeowners can achieve the strength, stability and independence they need to build a better life for themselves and for their families.